The first migration of Asiatic peoples across the land bridge to the Americas began as early, and possibly earlier than 25,000–9000 BCE. By 10,000 BCE, they had migrated as far south as Tierra del Fuego (now Argentina), the southern tip of South America. They formed small fishing and hunting bands, becoming part of the first group of indigenous “Americans.” As early as 2500 BCE, the Maya were already established in village areas and involved in trade with other cultures. They had also established complex religious and civil ceremonies. Between 1000 and 900 BCE the Maya established larger, more complex and ornate buildings and cities. 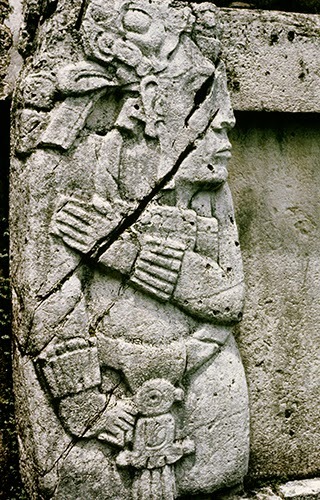 The Maya were influenced by the Olmec and Izapa cultures between 800 and 200 BCE, Teotihuacán and El Tajín between 200 BCE and 900 CE, and the Toltec and Aztec between 1000 and 1519 CE. 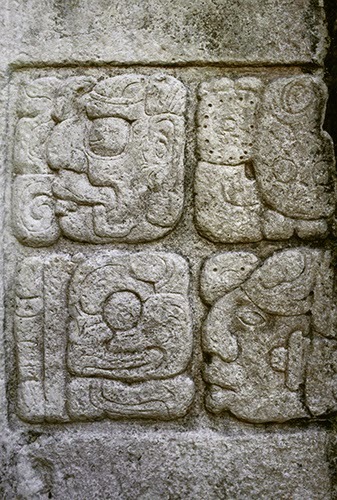 The Maya in turn influenced other Classic period (ca. 200–900 CE) cultures with their complex ceremonies, elaborate court etiquette and social hierarchy, cosmology, calendrics, and mathematics. 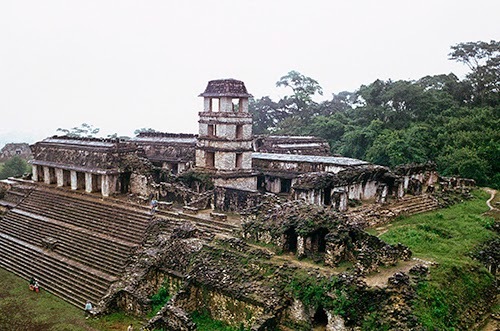 Palenque is one of the most beautifully laid out of Mayan cities. The architecture is inventive, elaborately decorated with relief sculpture, and well adapted to the humid climate. The elevated site commands a view of the plains stretching to the distant horizon, alerting the rulers of Palenque to approaching threats or important visitors. Because the Mayans had no draft animals or wheels, they used the many rivers as their main transportation arteries from city to city. Not far from Palenque is the Umusacinto River, which was the city’s main trade route. This was an important artery because it allowed communication between cities along the Bay of Campeche, then inland to the Petén. Maya rulers could participate in neighboring ceremonies and festivals, and architects could exchange views on techniques and current styles in each the various city centers. A centrally located palace complex surrounded by pyramidal temples on raised platforms dominates Palenque. The major construction of the palace and city took place under three great kings: Pacal the Great (603–683 CE), Chan Bahlum II (635–702 CE), and Kan Xul II (644–711 CE). During the reigns of these rulers, Palenque went from a minor ceremonial center to a major city of the Mayan world. Indeed, many Mayan cities at the time had populations that were larger than most European cities of the same period. The Palace in Palenque, topped by a Mansard-style roof, was built in stages over earlier subterranean chambers. The most striking feature of this building are the numerous stucco reliefs, primarily of ruling families, ceremonies, and deities. The reliefs run the gamut from realistic to stylized. There are also beautiful friezes of glyph panels. Most of the reliefs are carved limestone or stucco, lime powder mixed with water. Many of the temples in Palenque are also covered in rich relief carving. At the time, buildings in Palenque would have been painted red, and the reliefs painted in bright yellows, greens, and blues. The four story tower on the southwest corner—possibly meant as a lunar observatory, or a means of lookout for approaching visitors—is unique in Classic Period Mayan architecture. It also had important significance with the nearby Temple of Inscriptions (680s–700 CE), built as a mortuary temple to Pacal. At the winter solstice (December 21), the shadow cast by the rising sun falls directly in the center of the temple. The leaders of Palenque ruled and maintained administration from the palace, a typical feature of all Mayan cities. They also controlled surrounding towns and villages. While the palace at Palenque is renowned for its sculpture program, it also has architectural features not seen in other Maya cities. A steam bath, urinals fed by water ducts from running streams, air vents, and high vaulted ceilings to keep rooms cool, were part of the utilitarian innovations of the palace. The glyphs in this court record events of historical significance and the dates of the reign of certain rulers. This submissive figure may be a symbolic representation of fealty to the ruler of Palenque by the surrounding towns or villages. 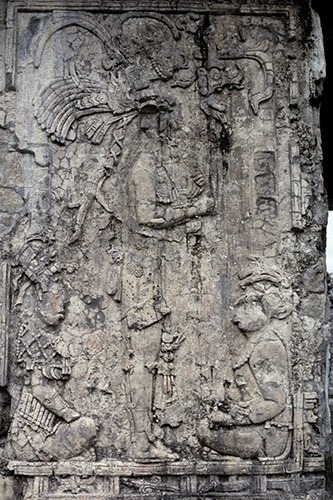 This relief is believed to show Pacal (standing center), symbolically receiving rule of Palenque from his mother (on the left), Lady Zak Kuk. Astronimacal glyphs surround the scene. ca. 27 BCE–ca. 330 CE: Rise and fall of the Roman Empire. ca. 618–907: Tang Dynasty in China reunified the country and experienced a flourishing in all of the arts. 554–774 CE: Byzantine Empire occupation of northern Italy and parts of North Africa in short-lived attempt to re-establish western parts of Roman Empire. ca. 500s–800 CE: The Early Khmer period in Cambodia during which sculpture, influenced by Indian art, flourished. ca. 668–918/935 CE: Unified Silla Kingdom, Korea, the first unified nation, experienced a flourishing of temple building, metal cast sculpture, stone sculpture, and literature. ca. 632–711 CE: Islam spread throughout North Africa into Spain, Palestine, Syria, Iran, Iraq, and the Arabian peninsula, initiating the first flourishing in mosque building.